Hi guys. 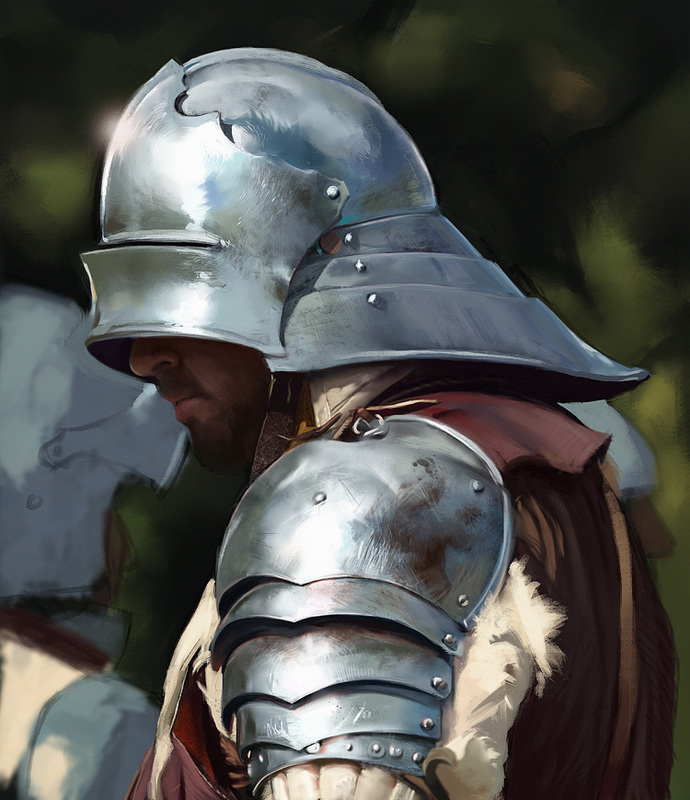 In order to pull off one new personal piece, I decided to spend some time doing some random armour studies. It's alsways fascinating experiencing how much there is to learn just from photostudies alone. by far the most fascinating part actually comes in retrospective after having done the study. 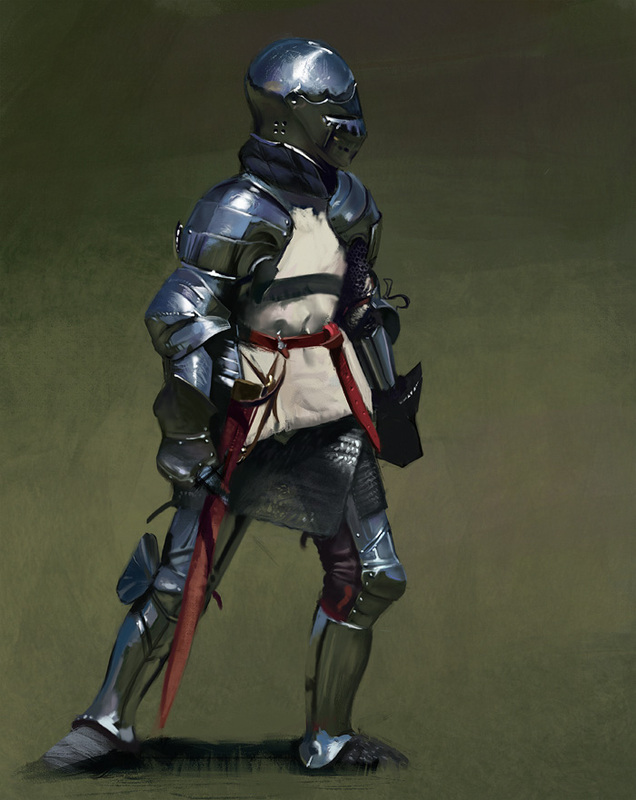 Before I did quite a bunch of those I thought that I knew how to render metal, and armor and stuff like that. looking at this thought now it's just sooo ridiculous that I had this opinion. in other words: I learned so much doing these studies that it isn't funny anymore, and I am sure if I do some more of those I will be blown away the same way again, it's just nuts and one more proof HOW neverending this whole journey actually is (yeah I know that sentence didn't really make sense but I think that it kinda fits nevertheless). So actually I don't know if this is of any interest to anybody but I figured it might be kinda interesting to actually write down the "major" things I think I've learned from doing these, so maybe it might help for some who are already up to make these discoveries, and maybe some of you might notice mistakes in my thoughts and correct me if I am wrong. So when I started these I wanted to focus on that entire "environment reflection thing" on armor in general. like when you have highly reflective metal like chrome youn will have this "horizon reflection"-thing going on, like on the helmet of the knight in the first piece. I wanted to see where it happens and when it happens and to witch extend it happens concerning the structure of the metal itself. Now maybe this is even too basic to be mentioned but thinking about it, putting this really clearly on the table for me is just so important since it is a basic principle, it needs to be understood in order to be able to render not only highly reflective armor but to understand how light in general bounces around. First: This "horizon thing" happens in every outdoor scenario, EVERYWHERE, but sometimes it cannot be seen on first sight. When painting this chrome armour it is as obvious as it's gonna get. Basically there are two things to be reflected by the armour: blue sky, green grass. Every part of the armour is reflecting teh part of it's environment it's facing towards. This is most obvious on the helmet. Teh upper part, facing the sky, reflects the sky, the lower part, facing the ground, reflects the grass. The horizon "wraps" around the form of the helmet according to the form itself and the perspective it's viewed from. Soooo keeping this principle in mind you can see that ti also applies to the helmet in the seccond study but not as obviously as in the first study simply because the metal isn't as polished as in the first study, so not bein able to giving these clean reflections: The reflections of the sky, clouds and the green ground are way more diffused. Also the reflectioms are in themselfs distorted because of random bumps and scratches in the armor. BUT (and this is the important part that needs to be taken away from these studies) ALL the reflections which can be observed in the first study are still there in the second, but they are more diffuse and distorted. AND this needs to be hammered into the brain: these reflections, or better: the light causing the reflections (sun, sky ground) is EVERYWHERE, it's even in the cloth and the brown west but they reveal themselves in different ways, cloth and metal interact in very different ways with the same lighsources, this is why we can distinguish between armour and cloth in a picture. it really is all about finding out what LIGHT DOES TO STUFF, rather than trying to paint stuff "as it is" or as we think it is. Again, obviously this is all petty basic stuff but even now, having been into painting for some years now it is still so fascinating to me seeing these basic powerful principles of light revealing themselves in front of my eyes, allowing me to see the stuff I've been seeing all the time with entirely new eyes and from another perspective. It just feels so good taking stuff out of that area which you've kinda taken for granted and experience it conciously and being able to appreciate the simplest stuff in a much much much greater way. wow this is nice, can't wait to see you apply this to a personal artwork!